Easily backup and restore your iPhone contacts, simply share iPhone contacts with other Address Books. Import your backup contacts from iCloud. 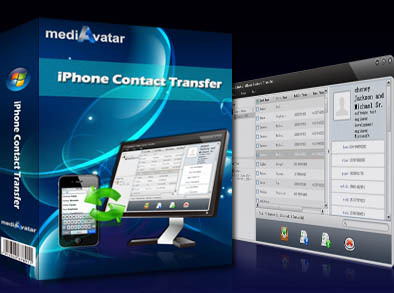 MediAvatar iPhone Contact Transfer provides an easy way to backup your iPhone contacts that you can backup iPhone contacts to the specific backup file that can be opened, edited, and restored to iPhone in one click. At the same time, you can export and backup the contacts to .csv file for Google Contacts or .vCard files for Outlook, Windows Contacts and other Address Books. In addition, this iPhone contacts transfer software enables you to import contacts from .csv file exported from Outlook/Outlook Express, Yahoo! Address Book, Google Contacts, Thunderbird, Aol Mail, Hotmail, and from vCard files exported from Google Contacts, Yahoo!, Windows Contacts, Fastmail, Skype and so on. In this iPhone contact transfer software, you can sort the contacts by certain items, view the contact info in list mode and iPhone-contact mode, search and delete the contact(s) as easily as on iPhone. Backup your iPhone contacts for future use; restore iPhone contacts from backups - mediAvatar iPhone Contact Transfer is a perfect solution. Backup the contact information to mediAvatar backup file, open and edit the file via mediAvatar iPhone Contact Transfer anytime without connecting iPhone, and restore to iPhone in one click. Import your backup contacts from iCloud to your iPhone. Export iPhone Contacts to .csv or vCard files for Google Contacts, Outlook, Windows Contacts and other Address Books. mediAvatar iPhone Contact Transfer provides concise interface and makes it easy to sort the contacts, view the contact info in list and iPhone-contact mode, search and delete the contact(s). iPhone Contact Transfer: How to transfer iPhone contacts to Outlook address book? How to sync your iPhone contacts to Yahoo? How to sync iPhone contacts with Gmail, Yahoo, Outlook, Hotmail, AOL, Windows or other address books? Backup your iPhone contacts to csv or .vCard files that are commonly used, or backup to a backup file that attached with this iPhone contact transfer and can be easily opened, edited and restored. The created csv or .vCard files backup files can be exported to google contacts, yahoo address book, outlook, window address book, and other mobile phones; and vice versa: csv or .vCard files from those items can be imported to iPhone contacts also. mediAvatar iPhone Contact Transfer displays the contact info in list and iPhone-contact, supports contact sorting and search box, and deletes the contact in one click, all of which makes it effortless to manage and view your iPhone contacts. It can be a iPad or iPod contacts transfer at the same time - using mediAvatar iPhone Contact Transfer, you can backup and restore iPad/iPod touch contacts also. Supports iPhone Contacts of English, German, Spanish, French, Italian, and Japanese languages and provides interfaces in all these languages. Provided support for transferring contacts on iCloud. Able to export iPhone contacts to vCard files (.vcf) for importing to Outlook and Windows Contacts. Optimized the operations of importing and exporting contacts. Can save iPhone contact photo to computer now. Download online videos to iPhone; Convert videos/audios to iPhone; Copy music, movies, photos, books between iPod and PC/iTunes; Create & transfer iPhone ringtones. Convert all videos to iPhone video MP4/MPEG-4 and music MP3/M4A.